We go to a diner or restaurant it is obvious that we are there for the food. But when a place gives you more than that, it's something, it's a level up. Where can you go to find burgers, bacons and board games all in one place? Burger Company! Burger Company used to be the Boulevard Diner but was reinvented as a place that specializes in Burgers and other chows created by enthusiasts of both good food and board games. The place is nothing fancy but definitely artsy! The resto's facade is covered by murals with its grill just beside the entrance. Couple of tables occupy the inside with a huge rack filled with hundreds of board games. 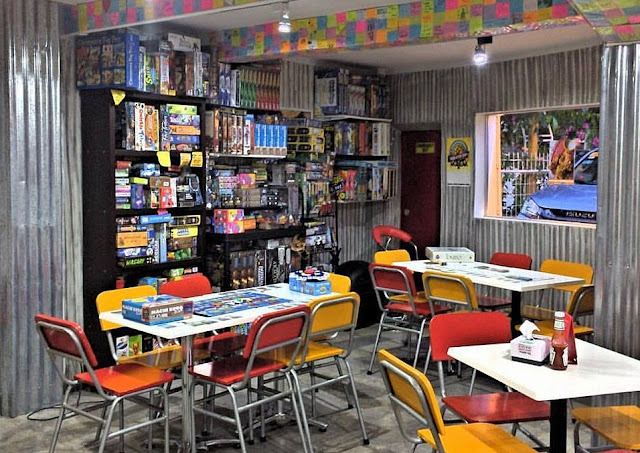 Customers are allowed to use the board games that aren't open yet; the ones still in plastic are for sale. Besides the fun of playing the board games, we were also treated with Burger Company's newest menu additions. 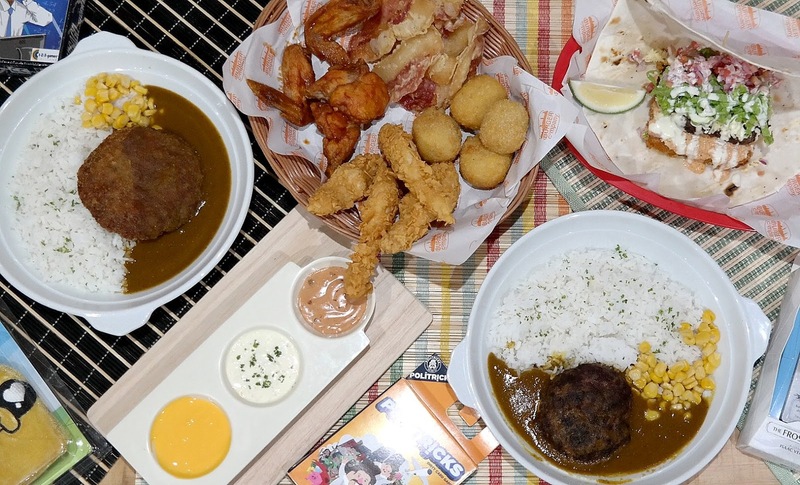 One of the owners, Alvin Ong (a fellow food blogger and Instagrammer) during one of his trips to Japan loved the Japanese version of curry and when he went back to Manila, had a light bulb moment of incorporating the curry with their burger rice meals. Hambugu Kare - this version uses grilled burger. By the way, all the patties at Burger Company uses Certified Angus Beef (CAB) The meat was juicy and tasty. The curry was light and surprisingly went well with the burger. I like the grilled version rather than the fried. Menchi Katsu Kare - lightly breaded CAB burger patty and with the same sauce just like the Hambugu Kare. You can opt to have both with cheese filling for an additional and minimal cost. You might be surprised, beef, cheese and curry? Yes, yes they all go quite well. Burgerrito - yep, it's the marriage of burger and burrito. It is made with flour tortilla, nacho hash (hashbrown), picante sauce, cheese, lettuce, pico de gallo, sour cream and lime wedge. A very unique dish with a very unique taste that explodes with flavor. This is not for the faint of heart because it is heavy and on the spicy side. If you have a big appetite, this would be perfect for you, but if not, you can always share it with someone. This can be ordered ala carte or with fries (Burger Company uses Potatoes USA btw). The Gamer's Platter - includes Bacon dippers, Cheese bombs, chicken firecrackers and buffalo wings with 3 dips. The bacon dippers are greasy good (it is bacon it supposed to be fatty and greasy right? Right! High five!). The buffalo wings were so spicy, I'm not into spicy food so I stayed away. If you love spicy food, this is for you. It's called the Gamer's platter I think because all are finger food that you can still pick on or reach for while you're busy thinking about your next move or strategy. Growing up, I only played a few board games like Monopoly, Millionaire, Scrabble and Snakes and Ladders. While at Burger Company we played some and I didn't know how a couple of these board games looked easy but were complicated and vice versa. Everyone's competitive attitudes surfaced. But we DEFINITELY had so much fun! Nothing beats good laughs and good food right? It was so fun that we're planning to schedule a board game night soon, hopefully! I wanted to try the Game of Thrones board game but that looks so complicated. Well maybe next time. The staff can help you with the board games and explain how they are played. But don't expect they know every board games, because, literally, there are hundreds on the shelf.